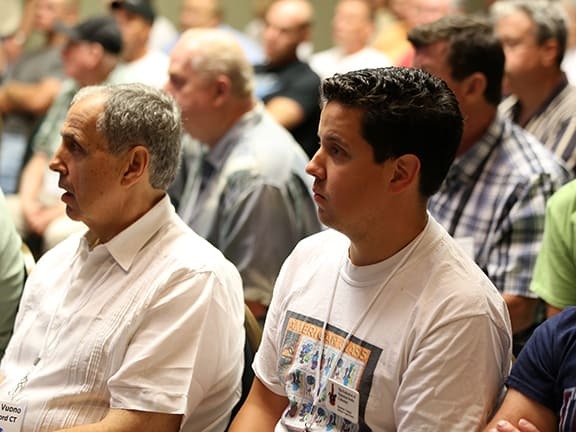 This next group of pictures come from the Seminars that occurred on Saturday morning from 9:00 am until noon. 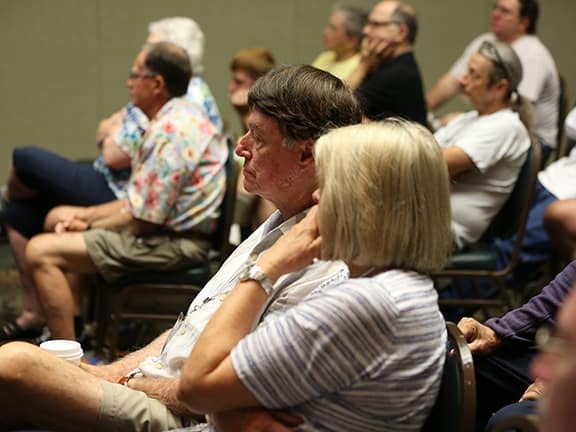 There were three sets of paired seminars to give attendees a choice. 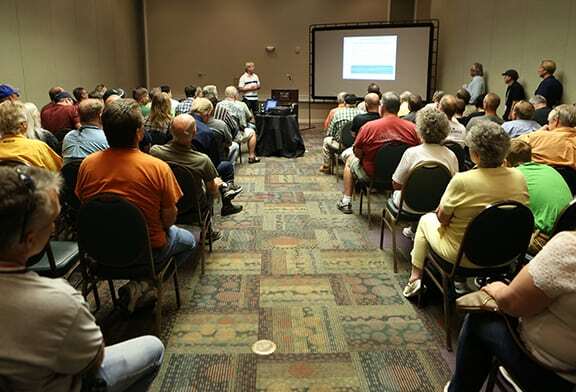 All seemed to be well attended and comments were extremely favorable. The rooms at the Hyatt were large, deep and sound insulated which was good. Jerry McCann began collecting fruit jars in 1967, and has added a wide variety of other antique categories including 19th Century artwork to American art pottery (especially Rookwood). Jerry now has a general fruit jar collection of 2,000 pieces made from the early 1800s to mid-century 1900s. 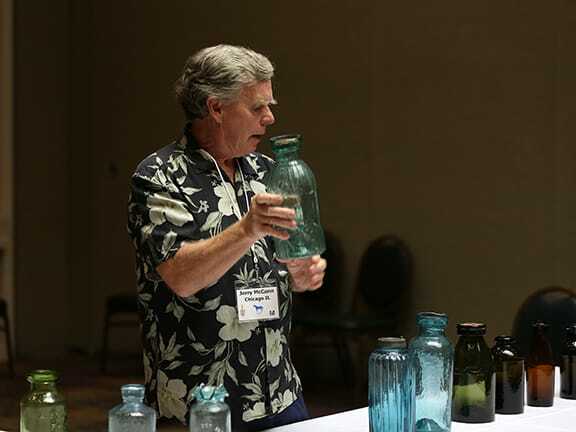 He specializes in oversize jars (those of one gallon capacity to five gallons) with more than 30 examples. 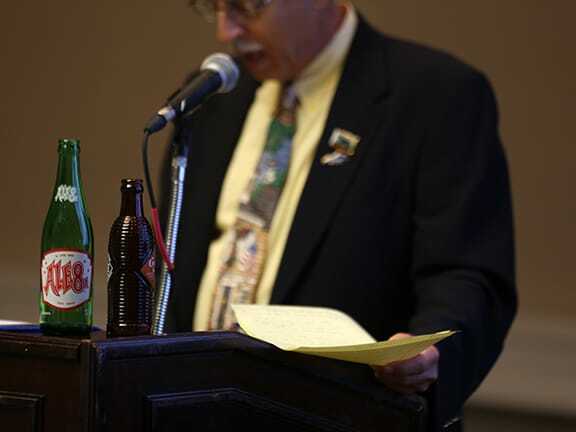 He has also chaired shows in Chicago, Eastern Michigan and Muncie, Indiana for the FOHBC, 1st Chicago Bottle Club, Ball Collectors Club and Fruit Jar Collectors of the Midwest. 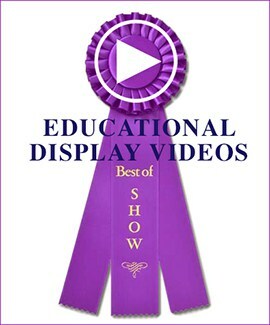 and has been published in Antique Bottle World (1977-1984); Fruit Jar Annual (The Guide to Collecting Fruit Jars, 1996-2014) and The Standard Fruit Reference 2011. By trade, he is a teacher of Biology and Chemistry and a Attorney at Law, with an advanced degree in Federal and State Taxation. His hobbies include road bicycling, hiking, backpacking, wilderness canoeing and car camping. This seminar focused on the development of a bottle form that would be a useful container for the storage and preservation of food. Early wax seal forms will be displayed to supplement the talk. These forms will include examples that were made and used in the Pittsburgh District which includes the Ohio River Valley from Pittsburgh upriver to Louisville, Kentucky downriver. 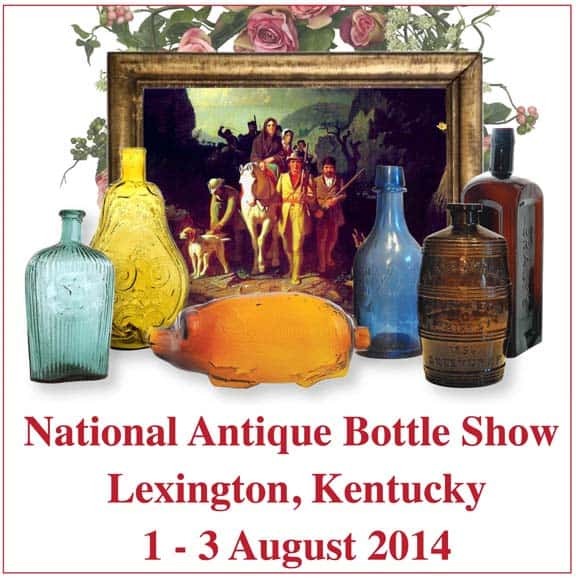 An effort will be made to bring in period pieces from the Lexington area. The presentation was structured somewhat informally with an opportunity for those attending to interact with questions and comments. Jerry brought an incredible variety of wax sealer jars for review and discussion. Gorgeous jars make a nice picture. 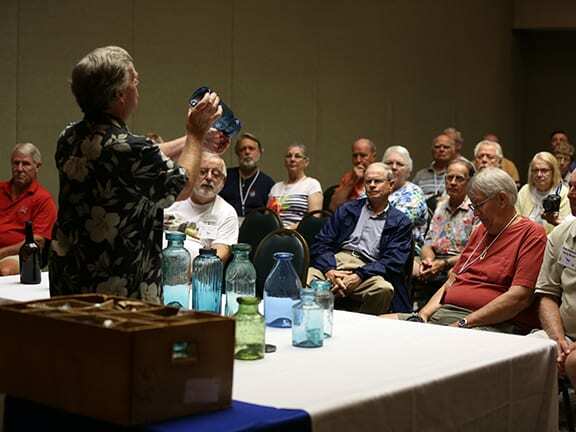 The crowd is very attentive as Jerry discusses each jar. 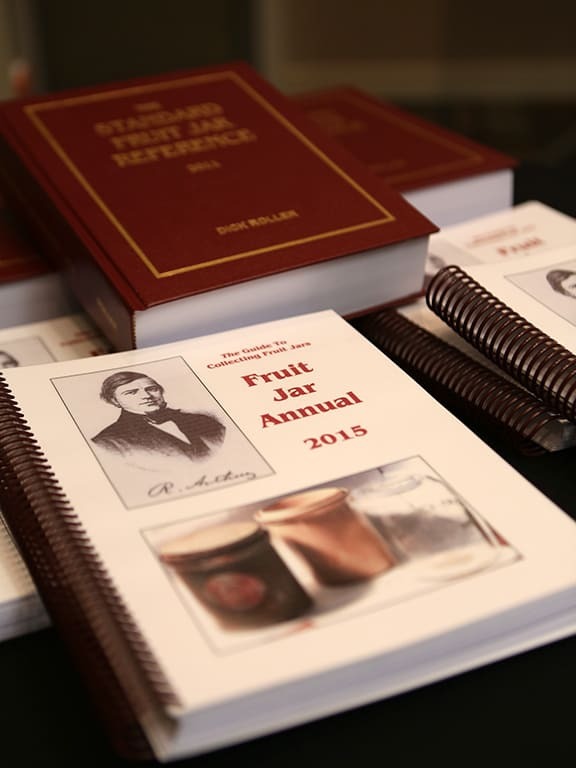 The latest Fruit Jar Annual was available for purchase. 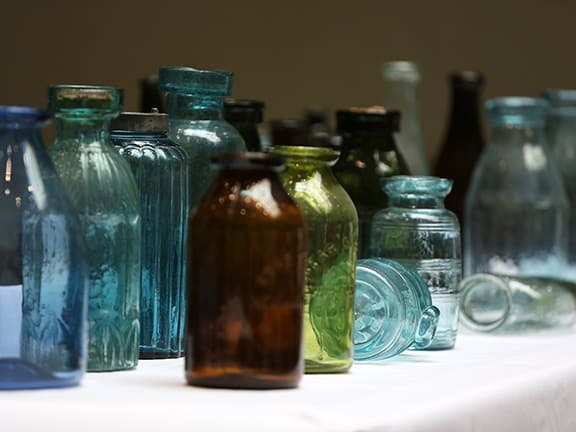 Randee Kaiser is a long-time collector of applied color labelled soda bottles from the 1930s to 1960s era. 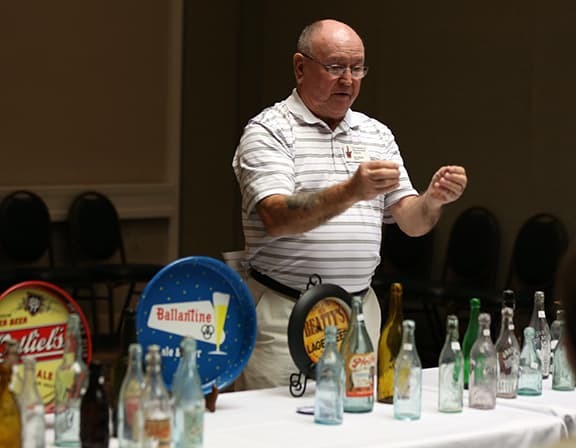 Along with his wife Susan, Randee is active in several historical organizations and both are avid bottle show supporters in the midwest. Americans have a well-established history of enjoyment of flavored sodas or, more succinctly put, we have a sweet tooth. And, there is even a soda by that name, ‘Sweet Tooth’, from Watseka, Illinois. The soda pop industry has persisted through thick and thin over the years and has continued to gain economic momentum not only in the United States but throughout the world in the form of multi-national corporations. 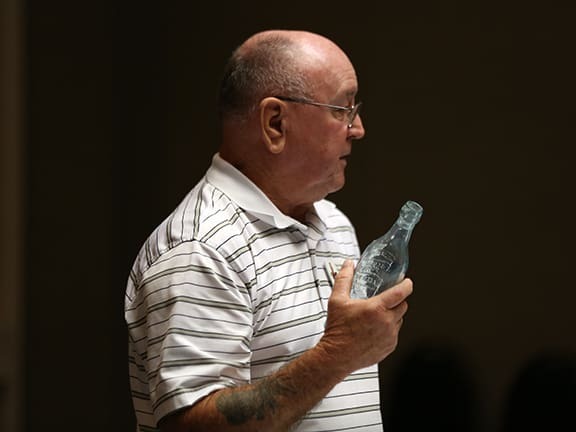 Sometimes going unnoticed, among the more well-known, highly competitive companies, were the local “mom and pop” bottlers serving their beverage brands in smaller communities in limited catchment areas. The advent of pyroglazed or painted labels offered these bottlers the opportunity to make their product stand out and catch the consumers eye. The subject matter on painted labels depicts a vast array of cultural, historical, geographic or even humorous themes. While the subjects of some labels may have had strictly local meaning, others represented easily recognizable images. Many have surprising artistic value while others are simply more utilitarian. 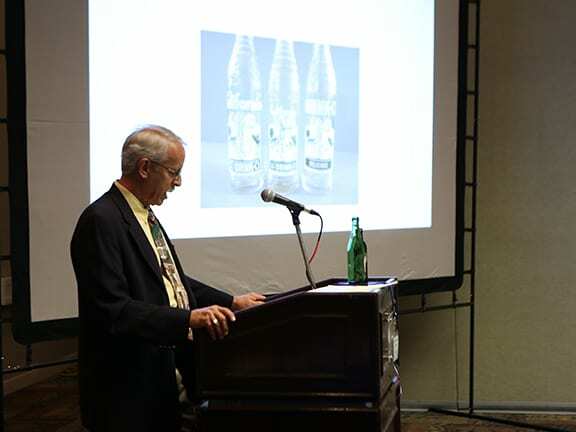 Randee presented an overview of the development of the applied color label process and share information on several small bottling companies. Several rare and beautiful bottles were displayed in addition to a power point presentation of Kentucky and horse themed labels. 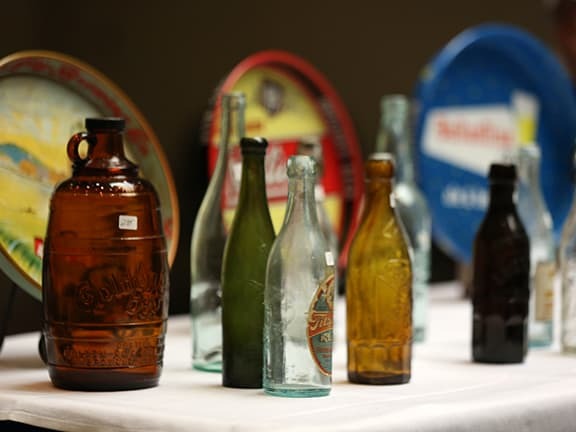 Several rare and beautiful bottles were displayed in addition to a projected presentation of Kentucky and horse themed labels. Lexington National Co-Chair, Randee Kaiser addresses the room. Randee always looking good in his jacket, tie, Kentucky pins, Federation badge and his ACL sodas. 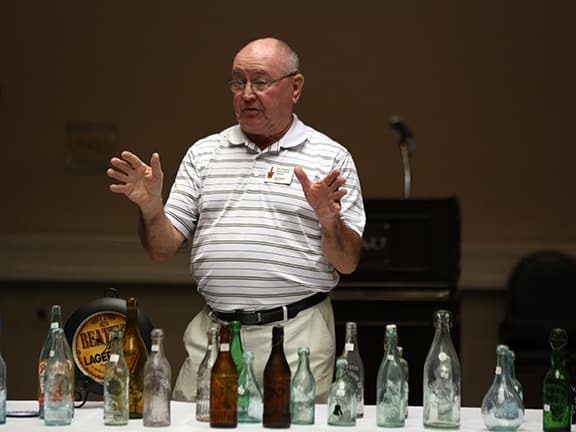 Gary Beatty has been collecting bottles since 1967. He found his first bottles in a township dump and has been hooked ever since. He has been President of the Ohio Bottle Club three times, Midwest representative to the FOHBC, Second Vice-President of the FOHBC, treasure of the FOHBC twice, and is presently serving in that capacity. Gary also has written many, many stories over the years for different bottle magazines and the Ohio Swirl. Gary has researched and helped install four different individuals into the FOHBC Hall of Fame. In 1972, Gary coined the phrase ‘Bottles Are Glass with Class’ that has been used by the FOHBC, off and on, over the years. Gary and wife Betty are also Life Members of the FOHBC. Gary is a graduate with a Bachelors degree from Midwestern Baptist College, Michigan, Trinity Baptist University Toledo, and has a Doctorate of Divinity from Heritage Baptist College, Hopewell, Indiana. Gary and Betty collect square bitters, gins, schnapps, beers and anything Ohio. Gary adds, “I have come to the conclusion that many collectors can not see the forest from the trees. By that I mean, many look right past the lowly beer bottles when thinking of collecting. 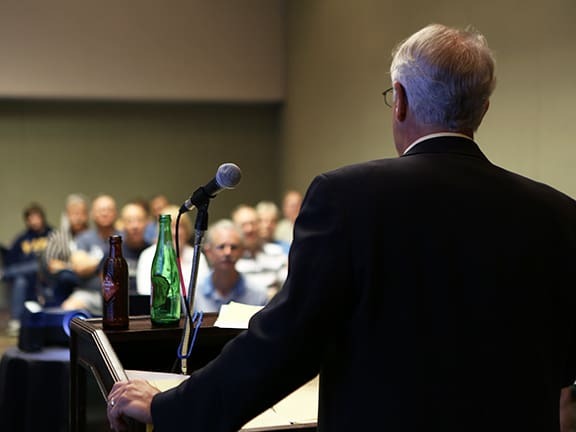 They see them on tables at shows but don’t really see them, if you know what I mean.” His mission in this seminar was to show that beers are very interesting, and very enjoyable. In fact, the average collector doesn’t have a clue of the variety that beers offer. Gary, all set up to talk beer bottles. Federation Treasurer, Gary Beatty talking beers. A wide variety of beer bottle shapes and glass colors. Listening to Gary is always a treat and gives you comfort as he is a Pastor by profession. Nice grouping of beer bottles and serving trays. The FOHBC Virtual Museum project is quite possibly the largest and most complex undertaking in our hobby’s history. Work on the Virtual Museum progresses on a number of levels such as fund-raising, design development and formation of a governing board. The concept still can be broken down into three major areas including the 3-dimensional creation of an experiential exterior and interior building space, site or museum navigation and bottle presentation. It is the experience that we are after to allow you to see and gather information on a specific piece. The Virtual Museum will be a digital expression of what one might find in a real ‘bricks and mortar’ museum. There will be galleries, exhibitions, resources and support functions to enhance the visitor experience. 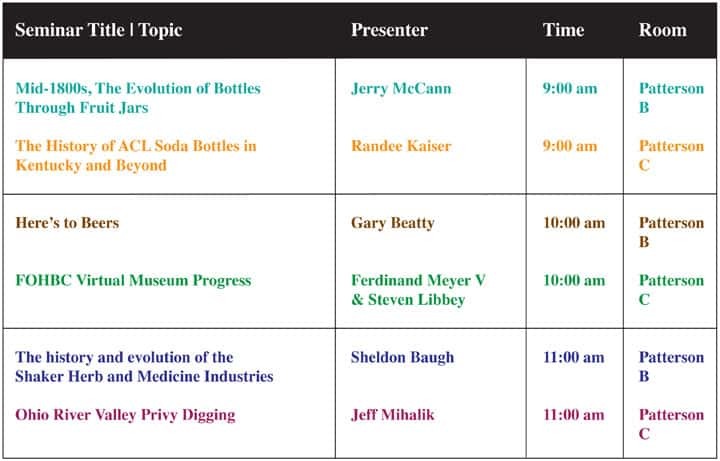 The museum will contain, but not be limited to, images of subject bottles and glass, a written description of those subjects with dimensions, and if available, the history of the bottles along with an estimation of rarity. The museum will grow and be expandable. 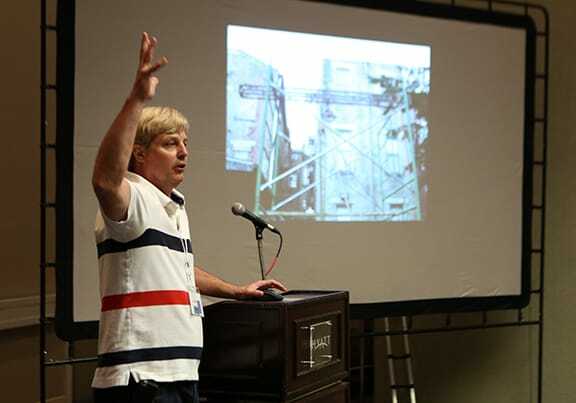 The seminar attendees were able to hear the latest news and see the latest designs from project designer, Ferdinand Meyer V and Steven Libbey who has joined the effort recently. Ferdinand Meyer V, FOHBC President, is a native of Baltimore, MD and has a BFA in Fine Art and Graphic Design from the Kansas City Art Institute and School of Design. 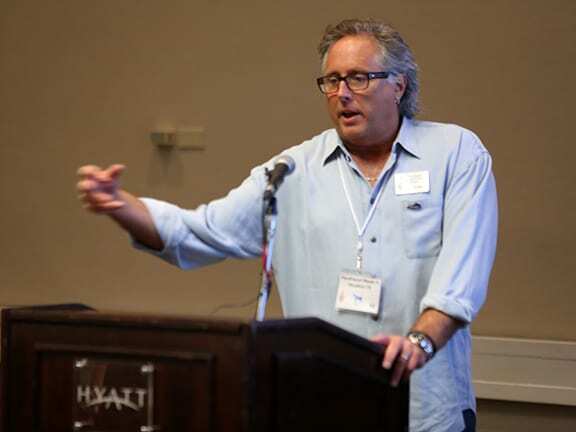 Ferdinand is also a principal of FMG Design (nationally recognized design firm). Ferdinand is a passionate collector of American historical glass specializing in bitters bottles, color runs and related classic figural bottles. Ferdinand is married to Elizabeth Jane Meyer and lives in Houston, Texas with their daughter and three wonderful grandchildren. The Meyer’s are also very involved in Quarter Horses, antiques and early United States postage stamps. Steven R. Libbey is a born and bred cheese head. 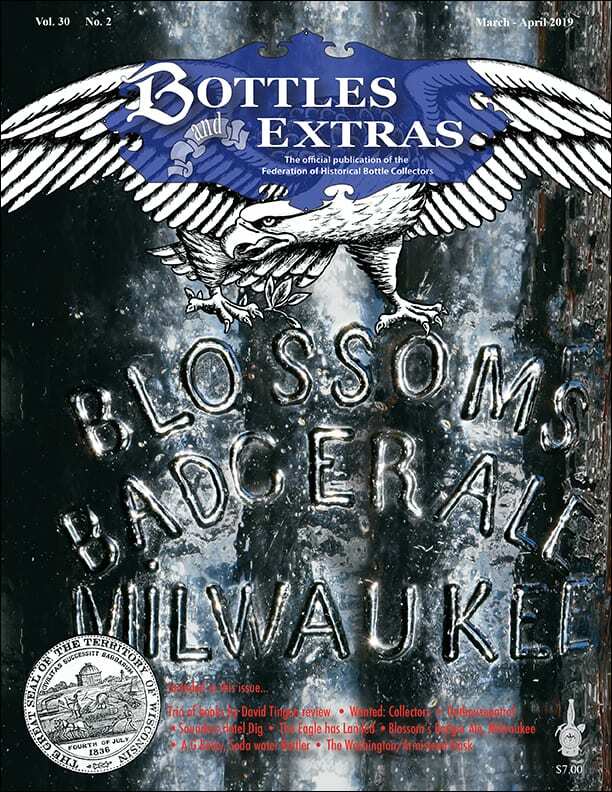 While interest and fascination may wonder, Steven is Wisconsin loyal with his bottles. Steven resides in beautiful Lake Country, Waukesha, Wisconsin with the four ‘loves of his life,’ wife Draga, Elijah 7, Beau 5 and Mila 4. 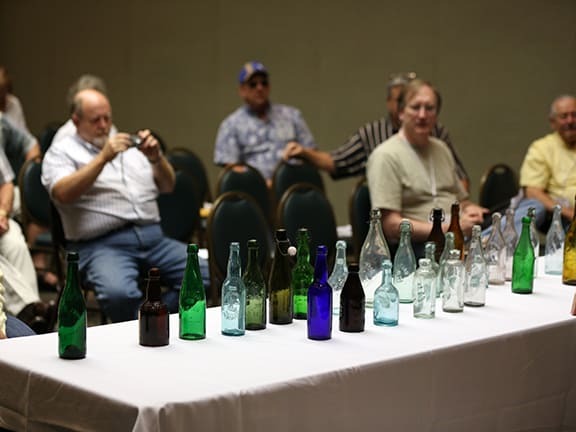 Much of Steven’s collection of early, rare and colored Wisconsin glass is displayed as “Spinners” on the Wisconsin, Antique & Advertising Club website. Steven is a principal of iNET Web & Marketing, sits on a number of non-profit boards, is the founder and director of the Milwaukee Domes Art Festival, loves flowers in the yard, raises honey bees, is addicted to participating in sports of all kind including scuba diving for treasure from Wisconsin’s past. Ferdinand Meyer giving an overview of the long-term Virtual Museum project. 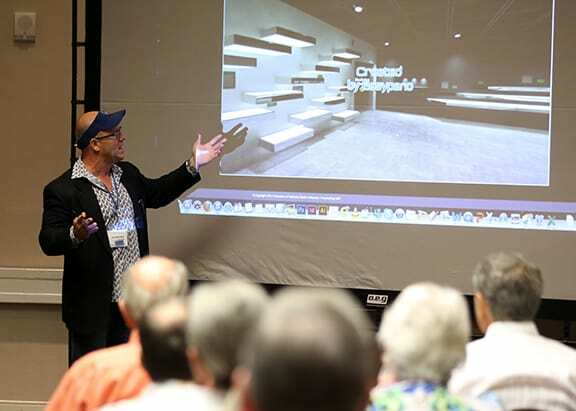 Steven Libbey presenting the latest virtual work for the interior galleries. 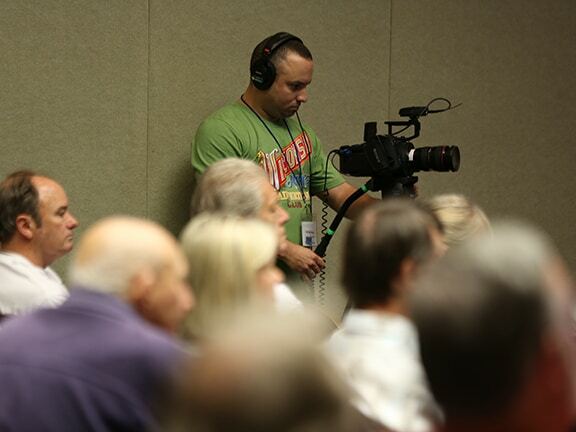 An edited 3-minute film of the seminar is being generated for grants and financial support. Cathy and Richard Tucker from Laguna Hills, California in the crowd. 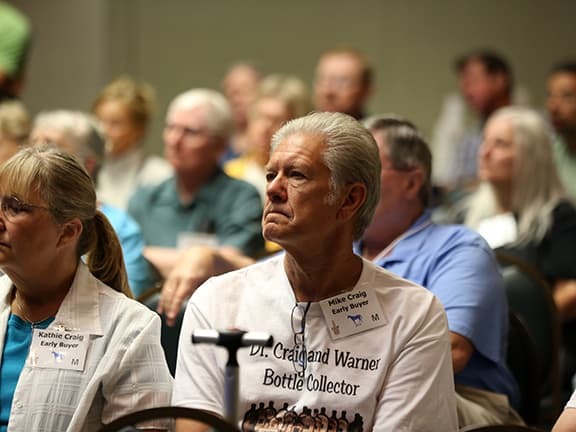 Warner bottle collectors, Kathie and Mike Craig (Campbell, California) in the crowd. Sheldon Baugh is a collector of bottles and go-withs for the many categories that he collects as well as anything that catches his eye. He proudly says that he is a ‘true collector’. Sheldon particularly focuses on bitters, both figural and squares, from the southern states and national companies. He also specializes in Shaker bottles and paper goods from the Shaker communities. Sheldon started collecting in 1966 after returning home from the United States Air Force. He attended Western Kentucky University and served in the Kentucky General Assembly for 14 years. He was also licensed as a securities broker for twenty years and from 1968 on, owned an insurance agency until last year, now working part-time as an agent. Sheldon is married to his wife Brenda, having celebrated their 51st anniversary in April 2014. The Baughs have two children and two grandchildren. 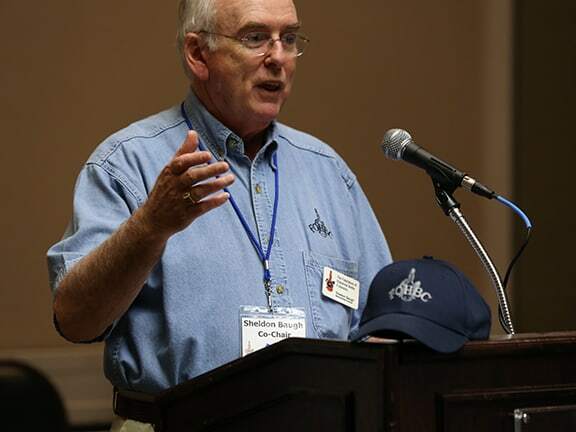 Sheldon is a life member of the FOHBC and served as the Midwestern Regional Director for six years, President for four years, Director at Large, twelve years, Merchandise Director, four years, and continues to serve the Federation. 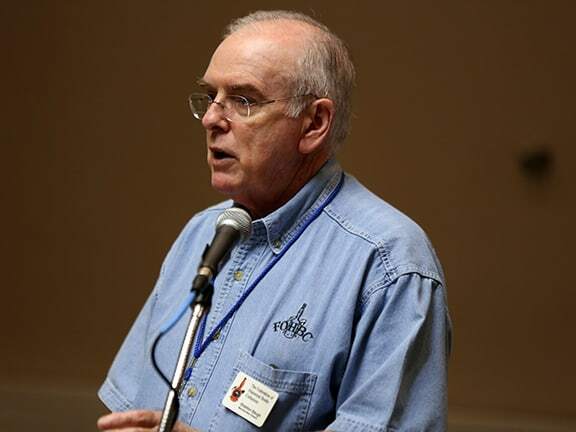 He also serves as a Deacon and Sunday school teacher for the Post Oak Baptist Church and many clubs and organizations in his community. 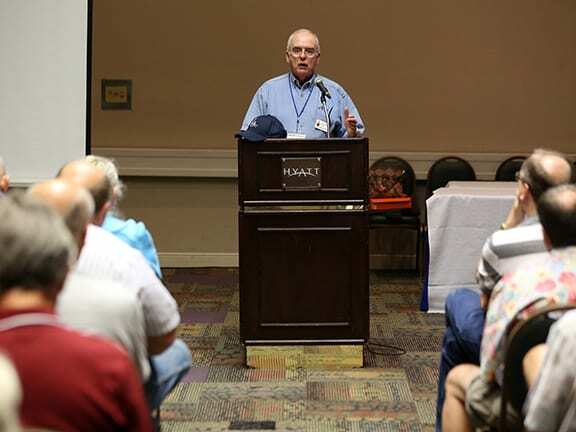 This seminar focused on the history of the Shakers, their communities and their industries, with a special emphasis on their herb industry for the communities use. The Shakers made products that were intended to last a lifetime which included furniture and household items. The Shaker outgrowth also produced the medicinal industry that we know today. Sheldon became interested in the Shakers and their industries because they had a community where he lives in Logan County, Kentucky. Lexington National Co-Chair Sheldon Baugh looking good in his Federation shirt. Bill and Bea Baab from Augusta, Georgia. Bill is a Federation Hall-of-Famer. Sheldon discusses Shaker bottles and paper goods from the Shaker communities. Jeff Mihalik’s college education includes a Bachelor’s degree in Environmental Science and Master degrees in both Biology and GIS (Geographic Information Systems). He originally planned on studying archaeology in college, but after getting some formal training, decided to go in to the environmental science field, then biology, and adds “as they say, I didn’t want to make my hobby, my career.”. Jeff is originally from Beaver County, Pennsylvania (born in Sewickley, Pa.), but lived in Texas for about 15 years, then returned to Pennsylvania in 1999 to be closer to family. He is currently working as a consultant with Moody and Associates, Inc. in Houston, Pennsylvania, mainly providing ecological and technical services to his clients in the energy sector. Jeff started bottle digging in dumps in Texas while in college (Stephen F. Austin, Nacogdoches, Texas). 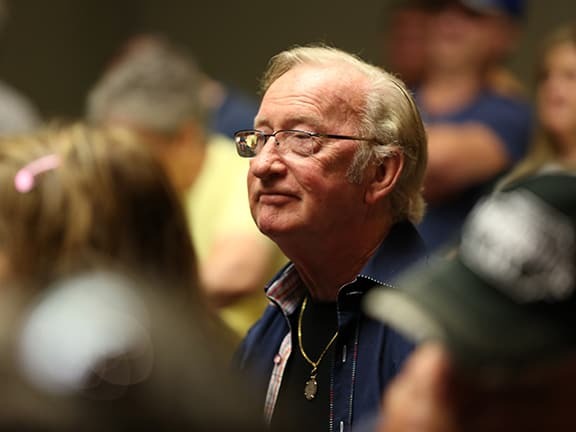 When he returned to Pennsylvania, he met up with Rich Ronczka who showed him how to locate privies and they became digging buddies and continue to dig for the last 15 years. 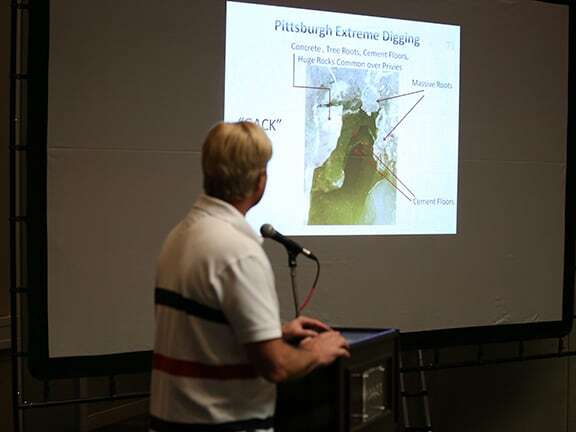 Jeff also does extensive digging with the extreme Pittsburgh digging crew (as seen in many of his more recent digging articles). 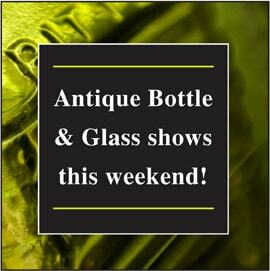 He has written many digging stories and other articles for both Bottles and Extras, as well as Antique Bottle & Glass Collector. 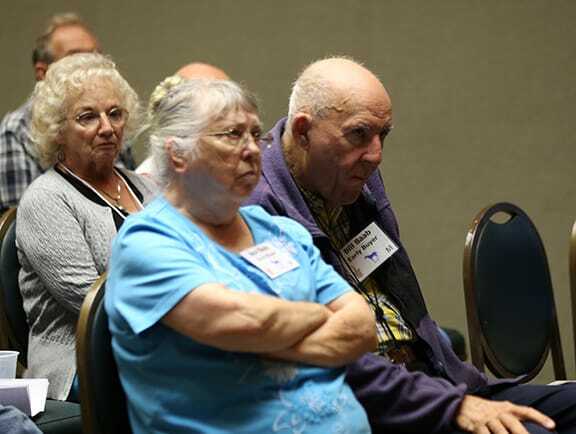 Jeff has given numerous talks to local historical societies and school history clubs in Pennsylvania and Ohio and even gave a talk at an AARP meeting and one family reunion, both of which had over 100 people attending! Jeff shared stories, experiences and information on his Ohio River Valley privy digging and said that he really enjoys researching history and finding artifacts that he can relate to the individuals who used the outhouses he digs. History is the key to our future! Dig In! Jeff needs to raise his hand to emphasize 20 to 60 foot privy digs. The dangers and extreme conditions were discussed in depth. Full house crowd as you might expect. History Flask collectors Mark and Andrew Vuono in from Stamford, Connecticut. Extreme Digging in Pittsburg being projected on the large Federation screen. Large and deep rooms at the Hyatt made for wonderful locales for each seminar.